I, Cognative, hereby vow the following force of One Chapter Champion with Thunder Hammer and Champions Blade to the Eternal Crusade before the end of November! 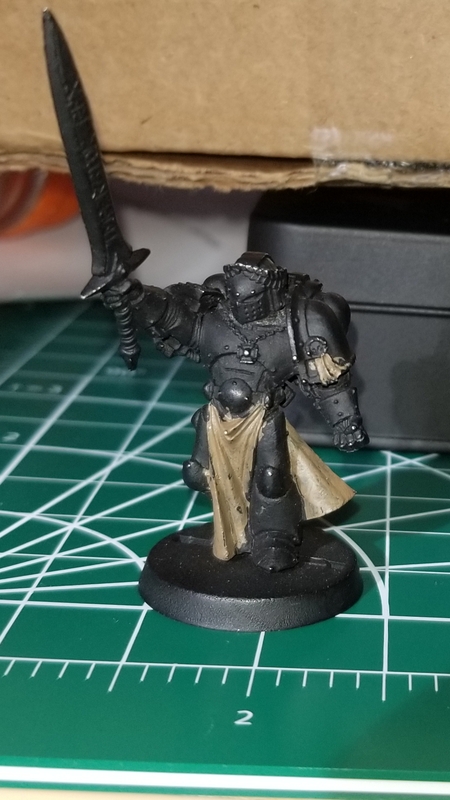 I enter with the mark of the Neophyte, and through the trials of fate and fire, rise to the rank of Initiate by journey's end as a true brethren of the Black Templar order. Should I fail in my vow, I will bear the mark of failure until year's end as repentance. Oh yes, now THAT is a very well executed mashup. Well done! A more recent WIP, I've still a lot to do, but less ahead than behind. I'm not sold on the falchion as the Champions Blade, I may redo it as a knife on the small of his back. And I just noticed I have to come up with a name for him to put on his Pauldron scroll. These guys were waiting for their paint to be done for a long time. I love the robed squad leader. Although, I always worry about assault marines with tabards. I saw the Incredibles. Edited by Brother Adelard, 16 October 2018 - 08:19 PM. We welcome Venerable Ancient Silvestre to the crusade, entombed in his revered relic contemptor pattern plate! Edited by Brother Adelard, 17 October 2018 - 06:45 PM. 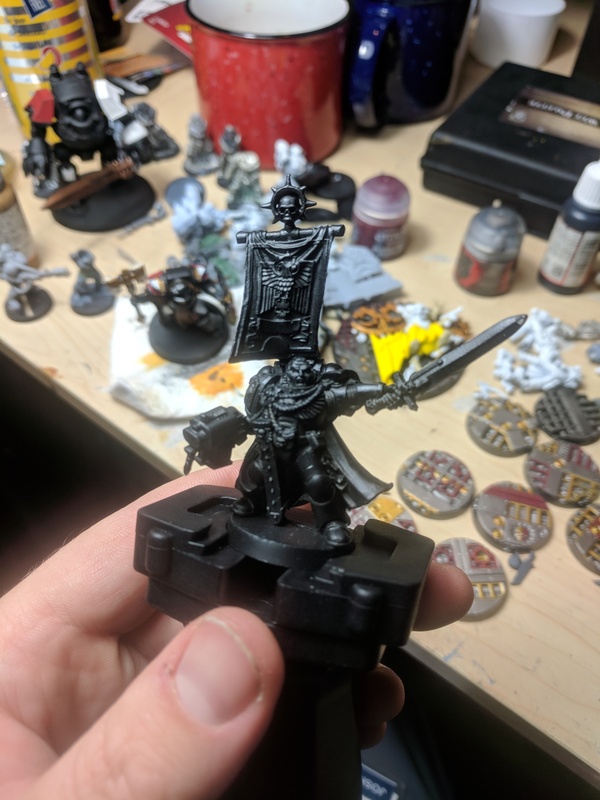 I, Cognative, hereby vow the following force of One Cataphractii Captain with Relic Blade and Storm Shield to the Eternal Crusade before the end of November! 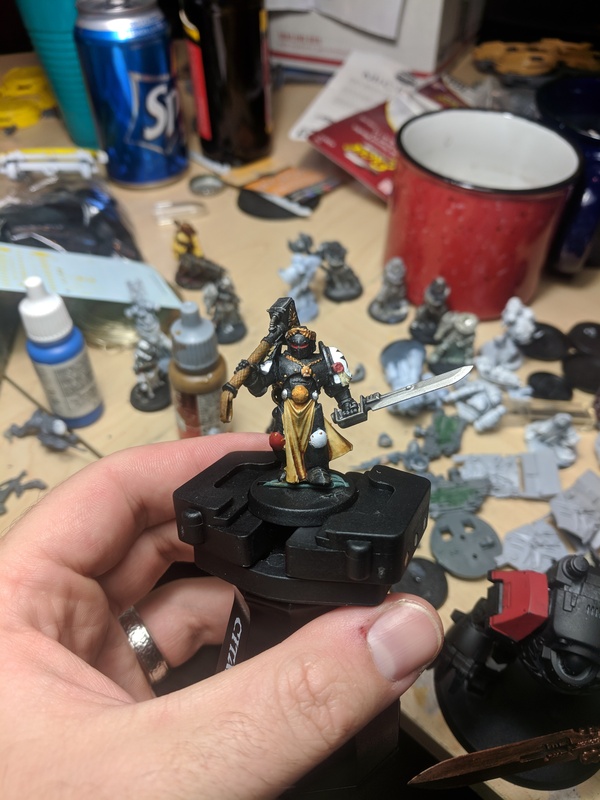 I enter with the mark of the Neophyte, and through the trials of fate and fire, rise to the rank of Initiate by journey's end as a true brethren of the Black Templar order. Should I fail in my vow, I will bear the mark of failure until year's end as repentance. Love seeing all the Elites. Our armies need good leadership! Keep up the outstanding work everyone, really glad we're getting some great vows in to inspire anyone else who wishes to join in the coming month. Remember Brethren, you have until November to vow and complete something. I'M LOOKING AT YOU HONDA AND THAT AWESOME KILL TEAM. For me it's more because most of my infantry is too far along to be entered. But that's okay, I've got a lot of Characters who need the love! 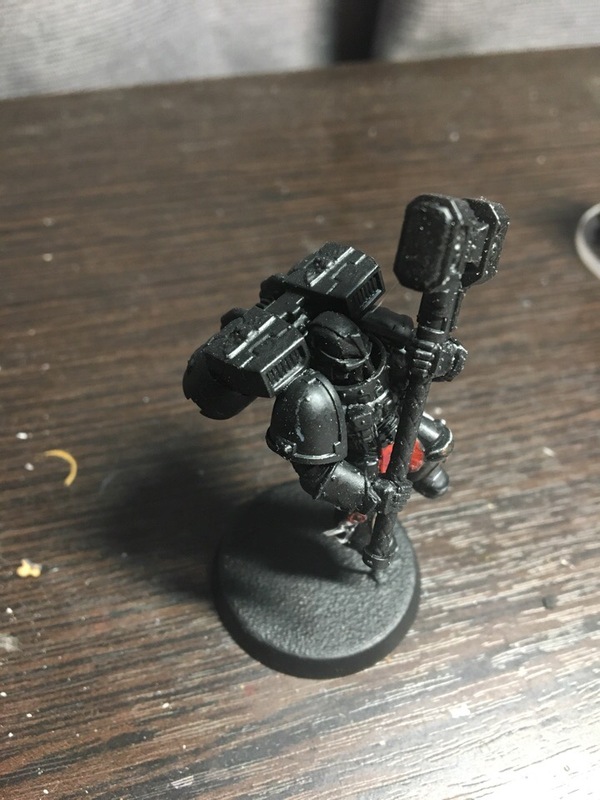 So as I was painting this bad boy I remembered how much I hate exposed heads on Marines. Snipping the normal head out was easy, but boy did the replacement helm not fit. 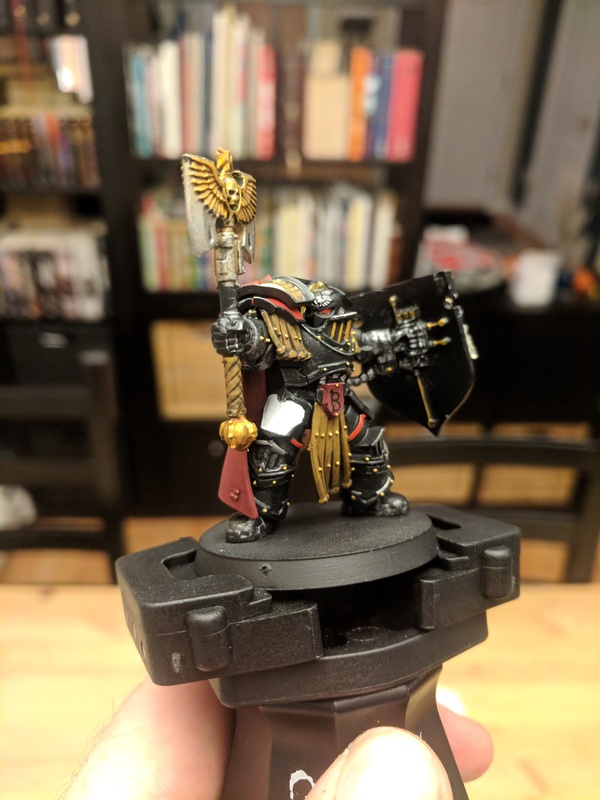 I had to do tons of trimming (it's only about a third of a helm at this point) to get it to fit and it looks.... Okay. 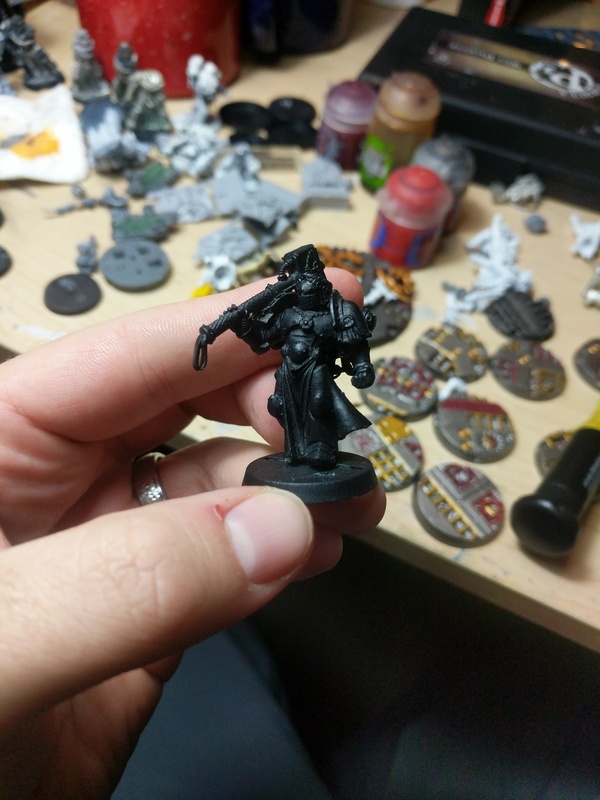 Trying to find my vehicle transfers to put a large cross on his back cape. And Zon, my last guy was a Chapter Champion, not Emps Champ, worth 81 points. Sorry for not listing the point before! "So stuff like the Power Axe on the Sword Brother being overcosted and inefficient just isn't relevant to me! I have a terrible secret. I use the Citadel Airbrush White Scar, and seriously anything with raised edges you can just glob it in. This is done in one coat. It will fill out to all the edges, then you just kind of gloop more on until you can't see through it and it'll spread out evenly on its own. 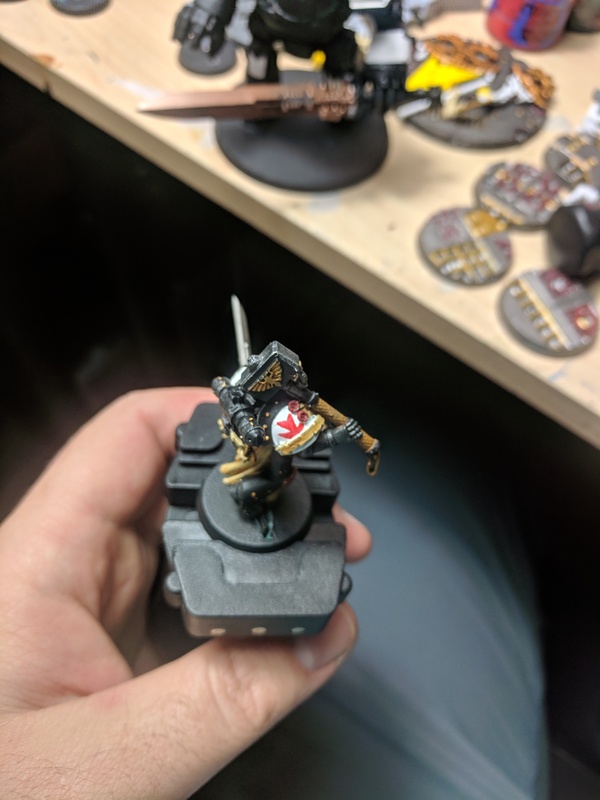 I, Cognative, hereby vow the following force of One Captain with Power Sword and Storm Bolter worth 80 points to the Eternal Crusade before the end of November! 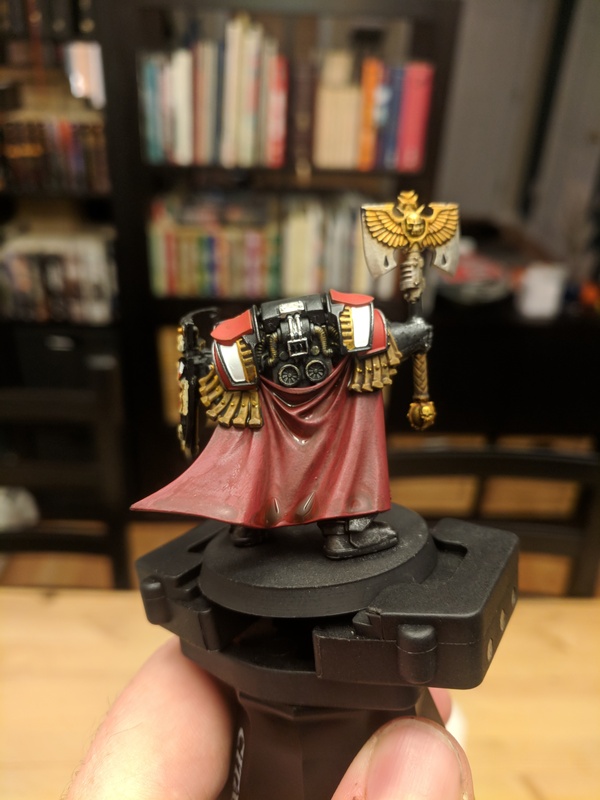 I enter with the mark of the Neophyte, and through the trials of fate and fire, rise to the rank of Initiate by journey's end as a true brethren of the Black Templar order. Should I fail in my vow, I will bear the mark of failure until year's end as repentance. 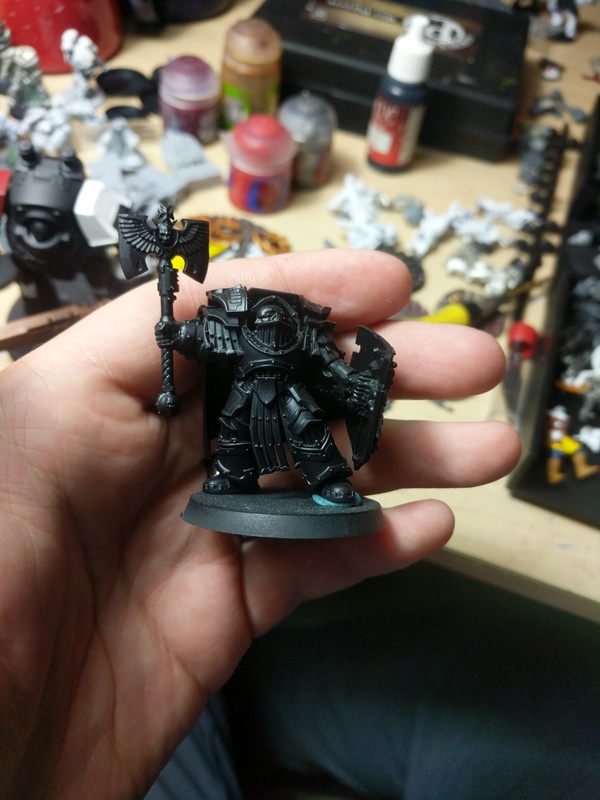 Old school metal Captain with a few plastic upgrades. Will drill storm Bolter barrels before painting. And my vow is completed. 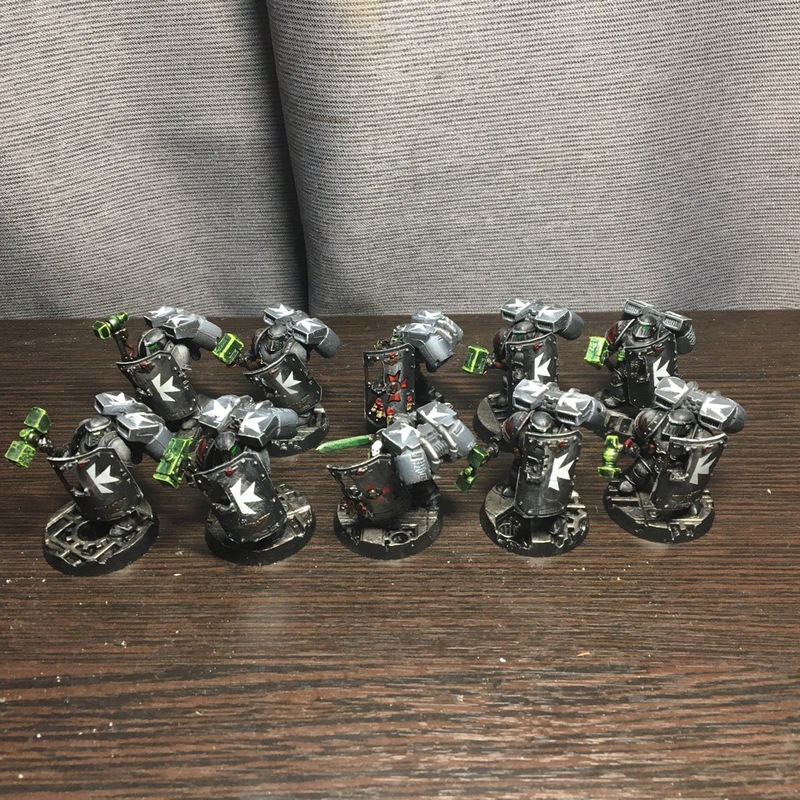 The 2 Black Templar Space Boarding Squads, made of Sword Bretheren. You better be careful if these guys board your ship, xenos and heretics. This event is so inspiring, i thought of a few models i want to paint for it too. Too bad my black tide is still in process and i'm waiting parts for neophyte units. Edited by Margulix, 18 October 2018 - 06:13 AM. Darn ... I've been on a bit of an Imperial Fist hobby push ... should have checked the BnC for events before starting ... only thing I had already started that would have qualified was a contemptor but still lol ..
Edited by Kisada, 18 October 2018 - 07:18 AM. Signature not compliant with forum rules. We'll crusade them so hard they'll die to death. Cussity cuss cuss those are gorgeous. @Margulix do you have a picture of their weapon arms/pauldron? The detail looks cool but I can't quite make it out. I'll be vowing a fourth character either tonight or tomorrow, just need to decide on a head and shield arm. 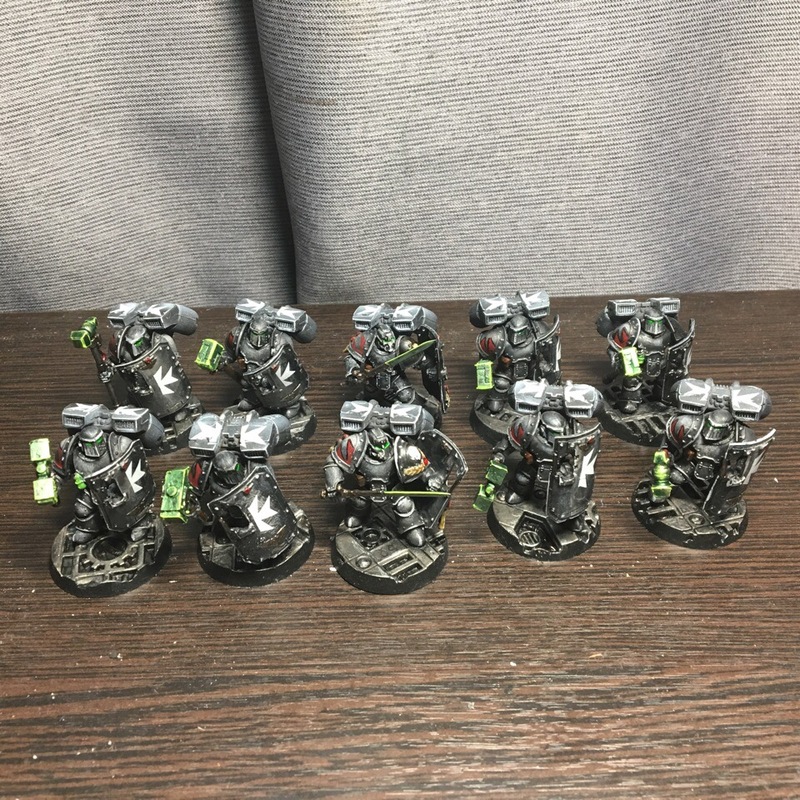 Unfortunately most of my other units/troops already have 2 or more colours blocked out, but painting these one-offs has been a huge inspiration and etude of sorts in technique. Edited by Othniel's Blade, 18 October 2018 - 02:43 PM. 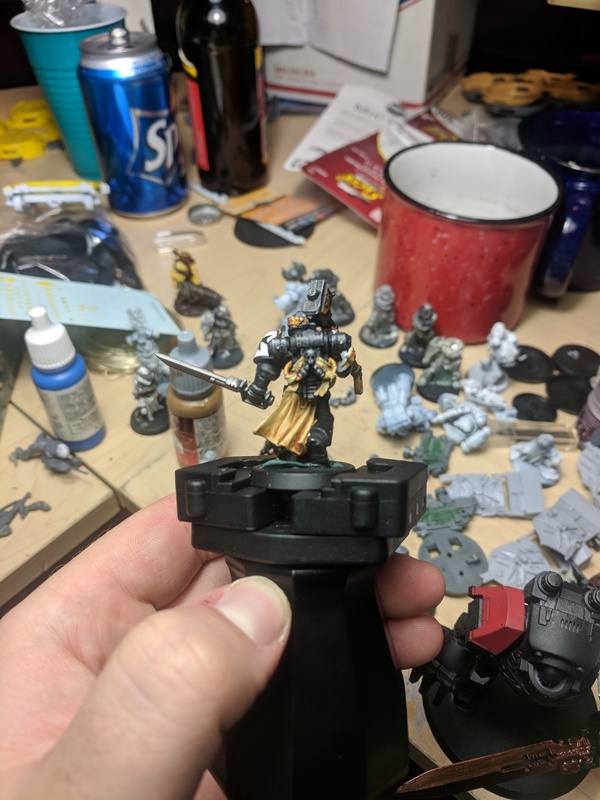 I, Apocalypton, hereby vow the following force of a Marshal with Jump Pack, Thunder Hammer and Storm Shield to the Eternal Crusade before the Night of the Witch! 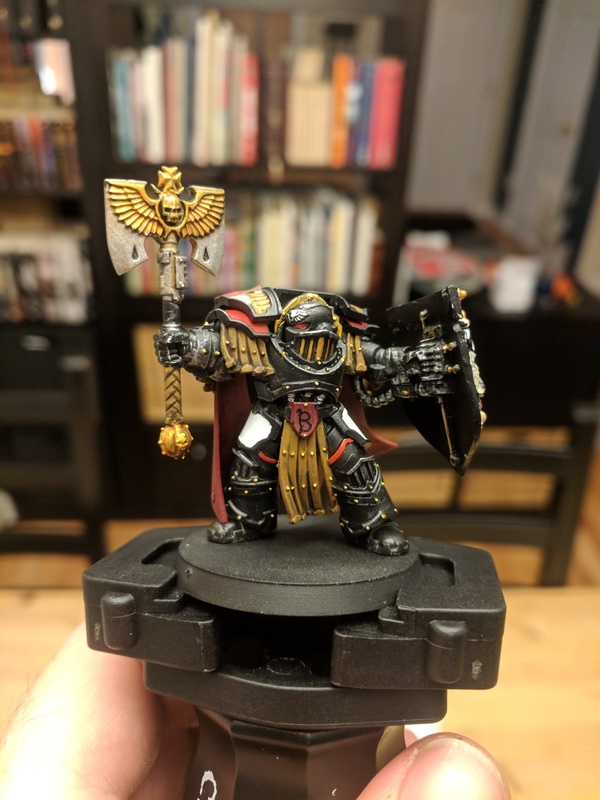 I enter with the mark of the Neophyte, and through the trials of fate and fire, rise to the rank of Initiate by journey's end as a true brethren of the Black Templar order. Should I fail in my vow, I will bear the mark of failure until year's end as repentance. NONE MAY WITHSTAND THE POWER OF RED. Ok, I guess I'm doing this. I Honda, a knight of Dorn commit to painting my Kill Team of Giants that I may unleash their holy wrath upon the weak, the faithless and the alien before the end of November.. My team shall consist of two initiates with a chainsword and bolt pistol (Tanna and Yael), a sword brethren with a power sword and bolt pistol (Atticus Varda), and two initiates with bolters (Bracha and Issur). I'll recolor his legs too, they are now from an old model. Edited by Margulix, 19 October 2018 - 08:40 AM. 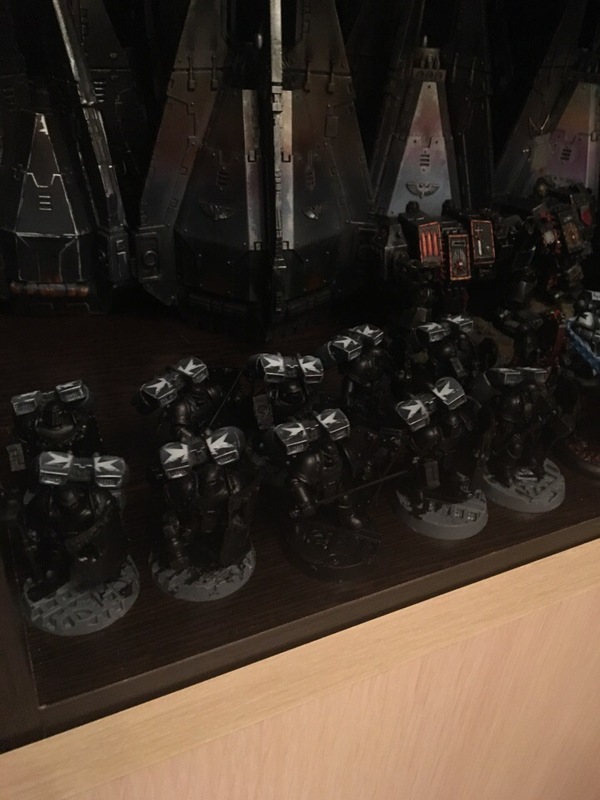 I, allegedlynerdy, hereby vow the following force of 1x Emperor's Champion (75 pts) to the Eternal Crusade before the end of November! 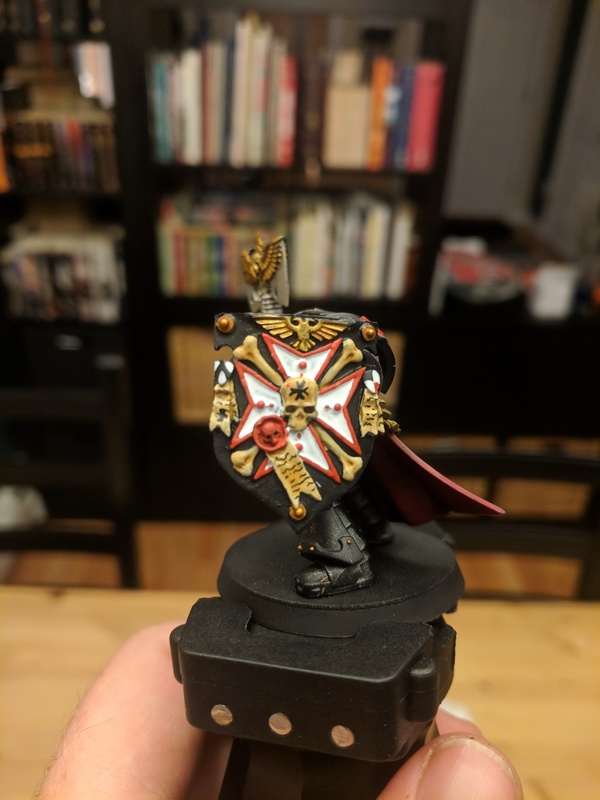 I enter with the mark of the Neophyte, and through the trials of fate and fire, rise to the rank of Initiate by journey's end as a true brethren of the Black Templar order. Should I fail in my vow, I will bear the mark of failure until year's end as repentance. Edited by allegedlynerdy, 19 October 2018 - 02:46 PM.